Karen and Guy Vidal are the owners of Design Vidal, an LA-based interior design firm. The couple is known for designing unique interiors that are truly reflective of the families who live within. Their love for creating one-of-a-kind spaces is evident in their very own Los Angeles home. 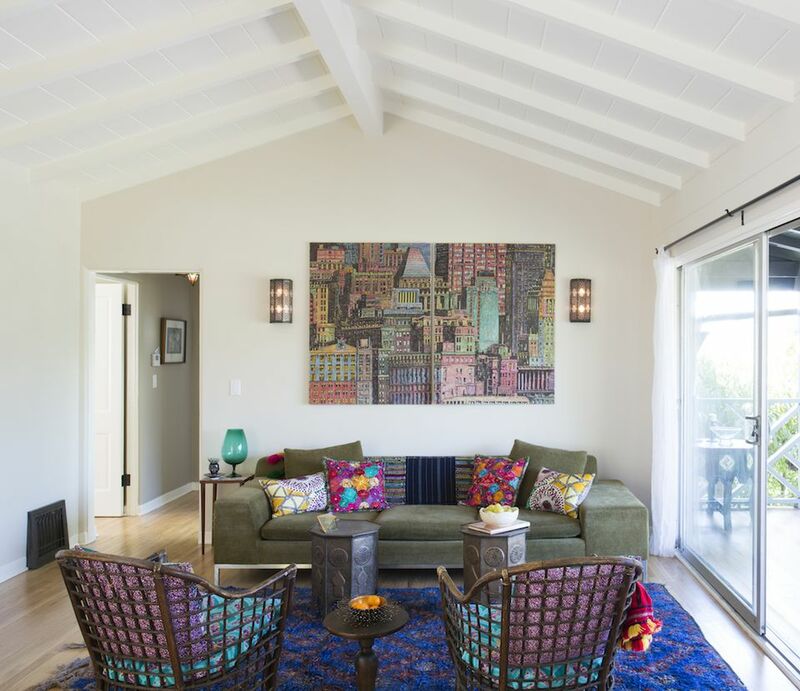 Filled to the brim with fun an funky style, this California interior has a bright and cheery environment perfect for this designer couple and their two children. One look inside this home, and it's clear that Karen and Guy have a love for global design. An eclectic mix of handmade pieces from the around the world can be spotted. From a bright blue boucherouite rug in the living room, to a sparkling Moroccan wedding cape in the bedroom, a variety of global elements have been used to accessorize this home. This home feels warm and lived-in with a variety of vintage pieces that add character. But in the kitchen, modern furnishings take center stage. The dining nook sports tufted seating in a cool gray. A set of Eames Molded Plastic Dining Chairs offer additional seating. Beyond their interior design work, the Vidal's are also known for their line of cement tiles - Granada Tile. Their tiles can be spotted in some of South America's most popular vacation spots, LA's trendiest restaurants, and even in their own home. Featuring designs inspired by a range of cultures, the collections includes tile inspired by traditional Turkish and Persian designs, and a host of other cultural references. In their kitchen, their Vuelo collection featuring birds in flight, covers the island and backsplash. The pattern is a modern interpretation of a traditional Turkish block print. The Vidal's embrace color in their work and in their home. The bedroom features a rich mix of colorful textiles for a warm, layered look. A curvy upholstered headboard is a beautiful backdrop to a mix of cushions on the bed. Blue bedding and drapery finishes off the space in a cool hue. Not afraid of color of pattern, a small powder room has been treated like a jewel box, covered in a whimsical green print. The effect is absolutely stunning. A touch of the unexpected, which is truly what sets the Vidal's aesthetic apart from the work of so many other designers. Above the bed, a piece form the Vidal's new line of wall hangings is featured. On trend with many of the accessories we see today, inspired by 1970s style, the Vidal's have created a line of wall hangings inspired by natural elements. Each pieces features a fallen California branch, natural sisal fiber, copper wire and mix of laser cut ornaments. These pieces, hand assembled in Los Angeles, embody the Vidal's free-spirited vibe. The Vidal's know how to make a statement with tile. At home they have showcased their collection in several rooms. Pretty green tiles are on display in the master bathroom. The rich green floor adds a wonderful pop of color to the serene space, making it feel like a spa retreat. In their son's room, a mix of vintage pieces come together effortlessly. Representing a multitude of periods in design, a shaker style bed has a rustic feel. While overhead metal lighting adds an industrial touch. Enveloped in a soft green shade, the bedroom is a relaxing environment for a little one. The bathroom for the couple's little ones features a fun mix of tiles. The floor is covered in their Petalo pattern. When pieced together, the hexagon pattern resembles flower petals. On the shower wall, the tiles feature colorful owls. The youthful design is perfect for children, and is a great summation of the Vidal's style. A fun mix of color, pattern, whimsy and cool patterns, that truly make a space feel one-of-a-kind.